On this date in 49 BCE Julius Caesar and his army crossed the river Rubicon thus initiating civil war with Pompey given that it was an illegal act of insurrection for a provincial general to lead an army into Italy. 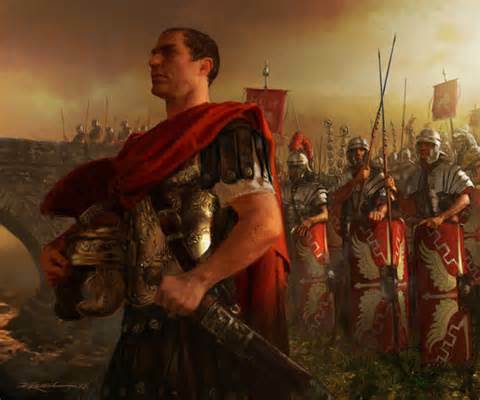 The Great Roman Civil War (49–45 BCE), also known as Caesar’s Civil War, was one of the last politico-military conflicts in the Roman Republic before the establishment of the Roman Empire. It began as a series of political and military confrontations, between Julius Caesar (100–44 BCE), his political supporters (broadly known as Populares), and his legions, against the Optimates (or Boni), the politically conservative and socially traditionalist faction of the Roman Senate, who were supported by Pompey (106–48 BC) and his legions. The idiom “crossing the Rubicon” now means passing the point of no return, especially when undertaking a risky enterprise. The Rubicon (Latin: Rubico, Italian: Rubicone) is a shallow river in northeastern Italy just south of Ravenna, about 80 kilometers long, running from the Apennine Mountains to the Adriatic Sea through the southern Emilia-Romagna region, between the towns of Rimini and Cesena. The Latin word rubico comes from the adjective rubeus, meaning “red”. The river was so named because its waters are colored red by mud deposits. 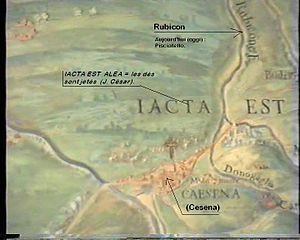 Because the course of the river has changed much since then, it is impossible to confirm exactly where the Rubicon flowed when Caesar and his legions crossed it, even though most evidence links it to the river officially so named. The river is perhaps most known as the place where Julius Caesar uttered the famous phrase “alea iacta est” – the die is cast. 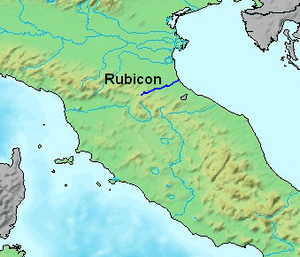 During the Roman republic, the river Rubicon marked the boundary between the Roman province of Cisalpine Gaul to the north-east and Italy proper (controlled directly by Rome and its allies) to the south. On the north-western side, the border was marked by the river Arno, a much wider and more important waterway, which flows westward from the Apennine Mountains (its source is not far from Rubicon’s source) into the Tyrrhenian Sea. Governors of Roman provinces were appointed promagistrates with imperium (roughly, “right to command”) in their province(s). The governor would then serve as the general of the Roman army within the territory of his province(s). Roman law specified that only the elected magistrates (consuls and praetors) could hold imperium within Italy. Any promagistrate who entered Italy at the head of his troops forfeited his imperium and was therefore no longer legally allowed to command troops. Exercising imperium when forbidden by the law was a capital offence. Furthermore, obeying the commands of a general who did not legally possess imperium was also a capital offence. If a general entered Italy whilst exercising command of an army, both the general and his soldiers became outlaws and were automatically condemned to death. Generals were thus obliged to disband their armies before entering Italy. It was reported that Caesar dined with his military leaders after the crossing, but no report of what they ate, otherwise I would give recipes. The phrase “crossing the Rubicon” has survived to refer to any individual or group committing itself irrevocably to a risky or revolutionary course of action, similar to the modern phrase “passing the point of no return.” Caesar’s decision for swift action forced Pompey, the lawful consuls (C. Claudius Marcellus and L. Cornelius Lentulus Crus), and a large part of the Roman Senate to flee Rome in fear. Caesar’s subsequent victory in Caesar’s civil war ensured that punishment for the infraction would never be rendered. After Caesar’s crossing, the Rubicon was a geographical feature of note until about 42 BCE, when Octavian merged the province of Gallia Cisalpina into Italia and the river ceased to be the extreme northern border of Italy. The decision robbed the Rubicon of its importance, and the name gradually disappeared from the local geography. After the fall of the Roman Empire, and during the first centuries of the Middle Ages, the coastal plain between Ravenna and Rimini was flooded many times. The Rubicon, like other small rivers of the region, often changed its course during this period. For this reason, and to supply fields with water after the revival of agriculture in the late Middle Ages, during the 14th and 15th centuries, hydraulic works were built to prevent other floods and to regulate streams. As a result of this work, these rivers started to flow in straight courses, as they do today. With the revival of interest in the topography of ancient Roman Italy during the 15th century, the matter of identifying the Rubicon in the contemporary landscape became a topic of debate among Renaissance humanists. To support the claim of the Pisciatello, a spurious inscription forbidding the passage of an army in the name of the Roman people and Senate, the so-called Sanctio, was placed by a bridge on that river. The Quattrocento humanist Flavio Biondo was deceived by it; the actual inscription is conserved in the Museo Archeologico, Cesena. As the centuries went by, several rivers of the Adriatic coast between Ravenna and Rimini have at times been said to correspond to the ancient Rubicon. The Via Aemilia (National Road № 9) still follows its original Roman course as it runs between hills and plain; it would have been the obvious course to follow as it was the only major Roman road east of the Apennine Mountains leading to and from the Po Valley. Attempts to deduce the original course of the Rubicon can be made only by studying written documents and other archaeological evidence such as Roman milestones, which indicate the distance between the ancient river and the nearest Roman towns. The starting point of a Roman road (some kind of “mile zero”), from which distances were counted, was always the crossing between the Cardo and the Decumanus, the two principal streets in every Roman town, running north-south and east-west respectively. In a section of the Tabula Peutingeriana, an ancient document showing the network of Roman roads, a river in north-eastern Italy labeled “fl. 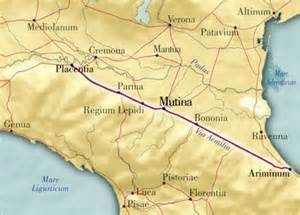 Rubicū” is shown at a position 12 Roman miles (18 km) north of Rimini along the coastline; 18 km is the distance between Rimini and a place called “Ad Confluentes”, drawn west of the Rubicon, on the Via Aemilia. However, the riverbed shape which is observed today in Pisciatello and Rubicone river, well below Roman age soil layers, is likely to indicate that any possible course modification of rivers could have occurred only very close to the coastline, and therefore only slight. Furthermore, the features of today’s Rubicone river (North-South course, orthogonal to the Emilia road) and Emilia road itself (a straight reach before and after the crossing, and a turn just passing by San Giovanni in Compito, so marking a possible administrative boundary) are common to typical geographical oriented limits of Roman age, being this a clue of actual identification of today Rubicone with Fiumicino. Today there is very little evidence of Caesar’s historical passage. 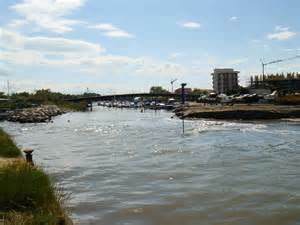 Savignano sul Rubicone is an industrial town and the river has become one of the most polluted in the Emilia-Romagna region. Exploitation of underground waters along the upper course of the Rubicon has reduced its flow—it was a minor river even during Roman times (“parvi Rubiconis ad undas” as Lucan said, roughly translated “to the waves of [the] tiny Rubicon”)—and has since lost its natural route, except in its upper course between low and woody hills. 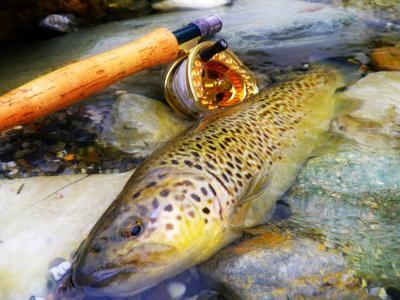 I will turn to Apicius once again for a fish sauce which you can use with river trout as a commemoration of the Rubicon where trout thrive. This is from De Re Coquinaria IX, x, 7. This is for grey mullet but it, like other fish sauces from Apicius, can be used for most fish. Aliter ius in mugile salso: piper, origanum, erucam, mentam, rutam, calvam, caryotam, mel, oleum, acetum et sinape. Another Sauce for Salted Grey Mullet: Pepper, oregano, colewort, mint, rue, filbert nuts, dates, honey, olive oil, vinegar and mustard. There are no instructions on how to use the sauce, but a great deal of Apicius’ fish recipes involve baking the fish. So here’s my interpretation. If I had a kitchen I would experiment; this has to be hypothetical, but it should work. A few of the herbs are not easy to find. I had all of them in my herb garden in New York. Colewort is wild mustard, so just double up on the mustard powder if need be. Pulse together all the ingredients in a food processor until they are blended together well but so they retain their integrity. Or, you can pound the dry ingredients in a mortar and then whisk them together with wet ones. This sauce can be used hot or cold. Bake trout fillets in a 450°F oven until they are cooked but not dry (about 20 minutes). Let the fish cool, and then chill. Arrange on a serving platter and pour the sauce over them. Place trout fillets in a baking tray and pour the sauce over them. Bake in a 350°F oven until they are cooked. Do not overcook and be sure the sauce does not dry out. My friend and client, Bill (W.D.) Neely, has written a rousing protest song (called “Rubicon”) ahead of the US midterm elections. We’d like to use the photo of Caesar as the cover art on CD Baby, and would be so grateful if you could direct us to the owner of the image, so we can pay a royalty for a high-resolution version for that purpose. Thank you so much for your kind attention to this matter — and if I can find dried colewort, I’ll be trying that fabulous trout recipe! Thanks so much, but the link didn’t come through on your message. Would you kindly try again please? Never heard of colewort ere this, but shall research whether it’ll grow here in the Poconos (northeastern Pennsylvania). Thanks again for your kind (and timely) reply! Colewort is also called wild mustard. I grew it in the Catskills. Brilliant! For sure it grows here, then. I’ll get on it next year! I love the wild arugula (my favorite green) that grows profusely in these parts. Thanks so much for the link, and for the botanical lesson. Looking forward to future edification and good eats!